VertiRackTM Vertical Ladder Racks mount to any wall in your industrial or commercial setting, offering a convenient and safe way to store your ladders. and step ladders in your facility. Ladders are hung on the wall mount ladder rack in a vertical orientation and secured in place via our high strength, easy to use ladder securing straps. 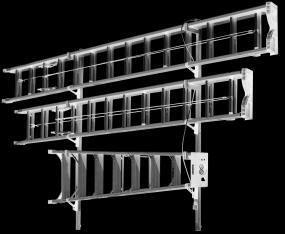 available for any size wall mount ladder rack. being stored lying flat in stacks that are difficult to go through and invite other stored items to be placed on top of them; or leaning against a wall, where they can be knocked over and damaged. VertiRackTM Vertical Ladder Racks allow ladders to be stored out on the plant or warehouse floor in a convenient location, but up out of the way of danger and potential damage. adjustability allows fine tuning ladder placement on the rack after the ladder rack has been mounted. The ability to adjust the ladder rack also allows users to offset the ladder support arms and ladder securing straps to accommodate multiple step ladders in the least amount of space. 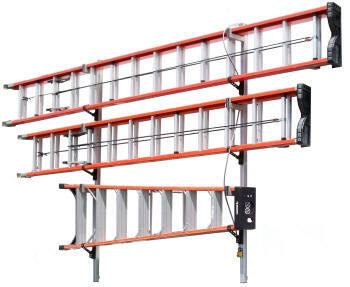 Storing step ladders and/or extension ladders is as easy as configuring the ladder rack to hold the desired combination of ladders. The use of rubber treaded ladder support arms and transportation grade rubber, ladder securing straps, isolate ladders from rack contact, eliminating ladder wear. weight capacities of over 100 lbs. per ladder support arm. These are not ladder hooks sold at the home centers. These extrusions are comparable in strength to 1-1/2" square, 1/8" wall, welded steel tubing, at 2/3 the weight. exclusive use of stainless steel hardware in their construction. VertiRackTM supplies 3/8" thick UHMW-PE high strength standoffs to space the ladder rack off the wall, thus accommodating irregularities in block and poured concrete walls. VertiRackTM Wall Mount Ladder Racks are drilled and counter bored at the top and bottom of the ladder rack's vertical rail to accommodate the 5/16" dia. hex socket head cap screws, or the 1/4" hex washer head lag screws, supplied with your chosen mounting kit. 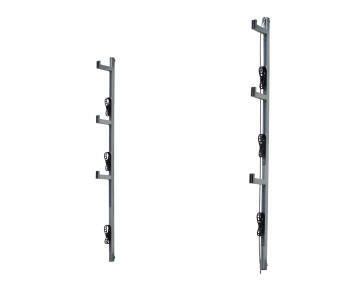 Mounting kits supplied with your wall mount ladder rack are available in your choice of hollow or solid wall mount types. Wall mount ladder rack supports should be spaced at a maximum of 6' intervals to provide proper ladder support and eliminate ladder sagging. Never store materials on ladders. Industrial Wall Mount One Ladder Rack, Style WM. Industrial Wall Mount Two Ladder Rack, Style WM. Industrial Wall Mount Three Ladder Rack, Style WM. VertiRackTM Industrial Wall Mount Ladder Racks are available in any size or configuration, please contact us for details.